I DO NOT Represent Amber Jurgensen's reporting and ONLY represent my 1st Amendment right through my words as researched @ http://anewsreporter.weebly.com/keel-and-curley-winery--two-henrys-brewing.html with Documented Researched where persons can come to their own conclusion. In My Opinion Amber Jurgensen's has decided to quote me in her words where I will share My Story through My 1st Amendment Rights using Public Records, Online Records Anyone Can Look up/Research, Requests Through FOIA (The Freedom of Information Act), Social Media and Clickable Links (Example) to Source Material by Themselves. When Speaking with Amber Jurgensen on the phone I HIGHLY advised the writer/reporter to contact the Hillsborough County Zoning Department: Michelle Heinrich, Joe Moreda, John Walker and Hillsborough County Code Enforcement and obtain under the Freedom of Information Act documents. NOTE: Hillsborough County Board of County Commissioners are also Hillsborough County Environmental Protection Commission - CONFLICT OF INTEREST? The EPC is NOT Regulated by the DEP (Florida Department of Environmental Protection); Why? Florida Department of Health - Hillsborough County - http://www.hillscountyhealth.org - (813) 307-8059 - Environmental Health Services inspects, permits and investigates any complaint associated with septic systems in Hillsborough County. All persons who install new or repair on-site sewage treatment and disposal systems (OSDTS) must first obtain approval from this department. How much Water is Keel and Curley Winery and Two Henry Brewing pumping out the Plant City Area? 768.295 Strategic Lawsuits Against Public Participation (SLAPP) suits by governmental entities prohibited. bringing or defending a proceeding, unless there is a basis for doing so that is not frivolous. sue by asserting claims of maintenance and champerty. KEEL AND CURLEY WINERY INC.
FOR THE RECORD: (Amber Jurgensen Stated in the Article and Quote, "She had met Oswald and others through church.") My Reply to this quoted statement: "I met all parties through community meetings and by chance found out some went to the same church as I did or using word majic I go to the same church they do." This is what I told the writer/reporter. FOR THE RECORD: (Amber Jurgensen Stated in the Article and Quote, “I want to keep the rural community the rural community,” MaGrath said.") My Reply to this quoted statement: "It is a Rural community." This is what I told the writer/reporter. I never made our conversation about me. In the beginning of neighbor meetings which turned to community meetings it was made very clear from the beginning this was NOT a church issue rather a community concern. The church/religious issue kept coming up. Why did this issue keep coming up? I started researching people. Person(s) of the community that went to the First Baptist Church of Plant City (FBCPC) were Deacons. Going through to confirm these person(s) were Deacons on the FBCPD (old) website I found a "The Deacon's Oath". (Note: FBCPC has a New website where I can not find the Deacon's Oath) I will be requesting this information to post here. Please check back. I asked myself while reading the FBCPC Deacon's Oath; If one accepts "The Oath of Deacon" and this oath interferes with activities outside the church which is the Deacon to honor? law that keeps citizens in the know about their government. 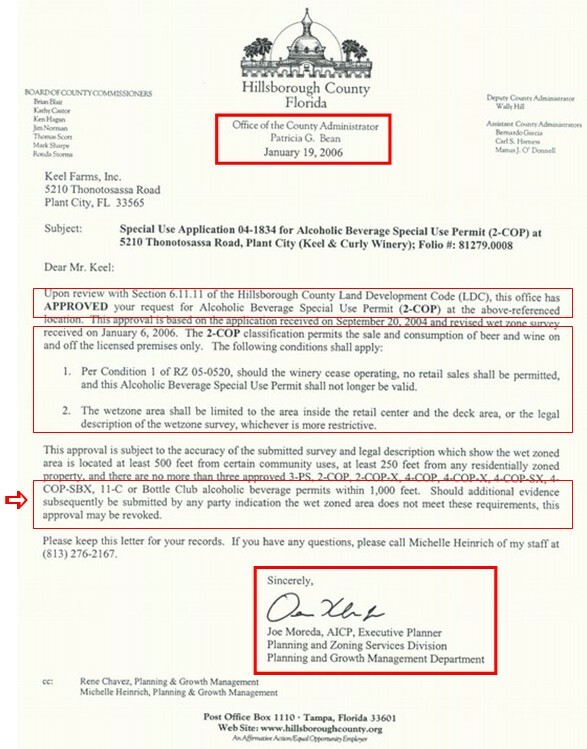 DOCUMENTS from the Hillsborough County Zoning - http://www.hillsboroughcounty.org/index.aspx?NID=904 Requested through FOIA. FAIR USE NOTICE: This website contains copyrighted material. The use of which has not always been specifically authorized by the copyright owners. I am making such material available in an effort to educate and advance understanding of the content contained on this page and throughout this website. This constitutes a "fair use" of any such copyrighted material as provided for in section 107 of the US Copyright Law, in accordance with Title 17 U.S.C. Section 107. The material on this website is distributed without profit and is for informational, research, and educational purposes only. Warning--any person and/or institution and/or Agent and/or Agency of any governmental, public or private structure including but not limited to the United States Federal Government also using or monitoring/using this website or any of its associated websites, you do NOT have my permission to utilize any of my profile information nor any of the content contained herein including, but not limited to,my photos, and or the comments made about my photo's or any other "picture" art posted on my profile. You are hereby notified that you are strictly prohibited from disclosing, copying, distributing, disseminating, or taking any other action against me with regard to this profile and the contents herein. The foregoing prohibitions also apply to your employee(s), agent(s), student(s) or any personnel under your direction or control. The contents of this website/profile are private and legally privileged and confidential information, and the violation of my personal privacy is punishable by law.